Christmas morning is always hectic. Everyone is excited to open presents and sometimes breakfast is forgotten until it's lunchtime! This hearty make-ahead casserole is the perfect solution. Mix it up the night before and pop it in the oven right when you get up. It bakes while the stockings and presents are opened and is ready to devour after the entire family has worked up an appetite. 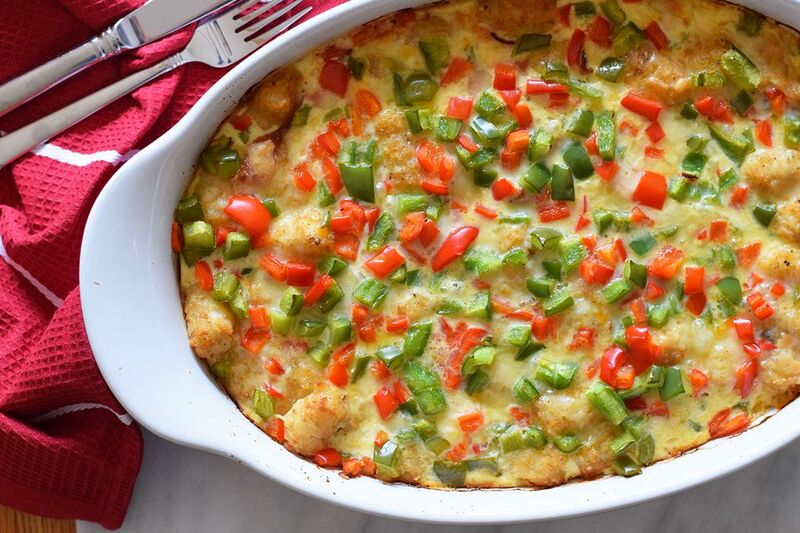 Ham, bacon, and tater tots are the star of this casserole, but it is also dotted with red and green bell peppers that give it that Christmasy vibe. You can easily sub the tater tots with shredded hash browns and feel free to use cooked breakfast sausage instead of the ham and bacon. Or, be a little wild and try all three! This recipe makes a nice large batch that is perfect for a large Christmas crowd, but if you have a smaller group, feel free to refrigerate it and eat it as a side for lunch or dinner! It goes with just about anything. This recipe calls for ham, ideally you can use your leftover Christmas Eve ham. Just dice it up and throw it in! However, you can also use your run of the mill deli ham if you're cooking up something different for Christmas Eve. Preheat the oven to 375 F. Grease a 9x13-inch casserole dish with cooking spray. Spread the tater tots, bacon, ham, and 1 1/2 cups of cheddar cheese into the casserole dish. Toss gently with your hands or a large spoon so that all of the bacon, cheese, and ham is evenly dispersed among the tater tots. In a medium-sized bowl, whisk together the eggs, cream of mushroom soup, milk, sour cream, pepper, salt, onion powder, and hot sauce. Pour the egg mixture evenly over the top of the tater tot mixture. Cover with aluminum foil and place in the oven. Bake for 45 to 50 minutes or until the eggs are almost completely set. Remove the aluminum foil. Top the casserole with the remaining 1/2 cup of cheddar cheese and evenly distribute the red and green bell peppers. Turn the heat of the oven up to 425 F and cook for 20 more minutes, or until the cheese is melted, the eggs are completely set, and the edges have browned. Serve with a nice slice of toast and some fruit for a beautiful and complete breakfast!